MISS NATASHA ENQUIST: ELECTRO-ACCORDION CHANTEUSE: I ♥ MÜNCHEN!!! Getting on a train and seeing the German countryside was a treat in itself... Arriving in Munich was the true gift for me! My Father's side is Swedish and Hungarian, and I'm learning more about these roots as my time here in Germany goes on. I knew more about my German heritage growing up though. I would hear my German relatives going on and on to each other in German, and I would just somehow understand them. I loved the food, the smell of the food, the music, the sound of the accent, the words, the culture in general - from being prompt, of your word, opinionated, brash, stern, and laughing and smiling a lot, and feeling the warmth of friendship and family. The attitude of there always is room for one more at the dinner table, and please, eat some more - more! Over the past 6 years, my German Grandparents have all passed away, and I felt a deep sense of loss in my heart because of this. I think this is big reason why I am more and more attracted to the culture, learning the folk dances, listening to the music, shopping for the foods I had as a child, being attracted to German kitsch, going to German clubs, and now moving to Germany. First my Opa passed, then my Grandmother that we called "Mutti", and then in 2011 Gerda, my Opa's third wife, passed away. It felt like I would never get back those moments I had with them, the dinners, and conversations, and music. Losing a pair of handmade German socks from Gerda, while living in an extended stay hotel in Orlando really set me over the edge. You want to somehow hold onto a piece of those memories, and stop them from disappearing. Munich holds all of these things within it. That missing link in my heart is alive in Munich! Berlin is full of splendor. Culture of all kinds. Music, theater, dance, art, photography, and it is very multicultural. I was told by friends that going to Munich would be the ultimate German experience for me. IT WAS. I saw on Facebook about a month ago or so that my friend Luke would be traveling through Norway and Germany. I got in touch with him and it turned out he was going to go to Oktoberfest. So, it was a perfect combination of seeing a friend and getting to see a city and party I was anxious to visit. Luke and I originally met in Hawaii, during a family vacation I was on 6 years ago. He was the towel boy at the hotel I was staying at, and I'm the kind of tourist that wants the 'local' experience. I like to see what the local's are up to, and not just be surrounded by crowds of tourists. I had a great time then, snorkeling at a secluded beach, meeting his friends and family, and running away from bugs. Upon arriving in Munich, I met Livia, who's apartment I was to stay in. She had tea and cake waiting for me to enjoy, and then invited me to have dinner with her family. We had duck, stuffed with apples, potato dumplings and red cabbage. I loved every bite, this meal was incredible. See those mountains behind me, in the distance? That's AUSTRIA! We all enjoyed a stein of beer at *the* Hofbräuhaus! It was great to visit this historical place. We had a giant Hofbräuhaus stein in our home growing up. I seem to remember we kept spatulas and big spoons in it on the counter. I think we had a few of these coasters too. We became fast friends, of course! This sweetheart then invited me to play the accordion :) What a dreamy day! I am READY for OKTOBERFEST! All the ladies! With some guy we didn't know! There was a lot of this though. "Can I take your picture?" and then "Where are you from?" were the two main pick-up lines of the day. It was charming at first, but by the 10th hour I was bored of telling people where I was from. I'm from Disney. Figure it out. Atomic wedgey turned into a beer sponge. Yes, that's right. His mates ripped out his underwear from his body, and then he immersed the remnants into a stein of beer, and then squeezed it out into his mouth, and then threw it at the angel, Aloisius, which was this giant beer angel hanging from the ceiling in the middle of the tent. Poor Luke, didn't feel well at all during his trip and was the first of the group to leave Oktoberfest :( He was such a trouper to come out though. I'll miss him! I don't know who this was, but she was very pretty and I'll call her the Beer Queen! I literally stumbled upon this church. Livia told me to see it, but I just walked into this yellow building unaware of what I was going to find. My mouth DROPPED. I have never seen anything so beautiful... since I think the Grand Canyon. An orange balloon found it's way all the way to the top of this cathedral. It was one of Douwe's balloons. On the day of his celebration of life ceremony in Victoria BC, a large group of friends released a huge number of orange balloons. Michelle, his wife, released one very large white one, and here in Berlin my friend Lisa and I let go of 10 multi-colored ones. Candle for Douwe. I said a prayer too. Livia was awesome. She is warm and welcoming, and on my last night in Munich we put on our dirndls, and had Kaiserschmarrn at a local pub - which Wassily Kandinsky once resided in. 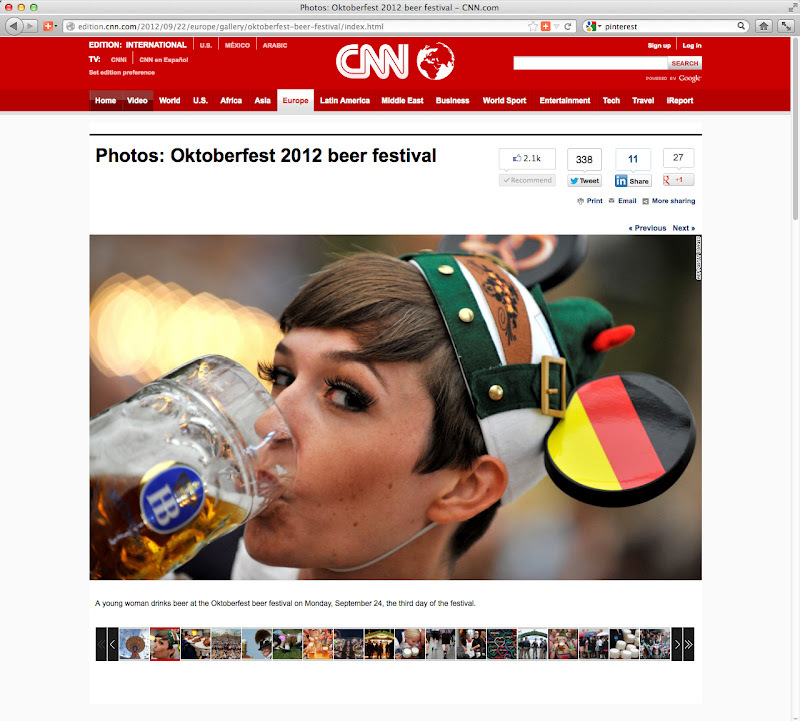 And then I was on CNN's website!